Michael Leonard interviewed author Michael Thomas Ford about his novel Changing Tides , Monterey and Steinbeck's Cannery Row , and the allure of ocean diving. Interviewer Michael Leonard: Changing Tides is a bit of a departure for you, especially in tone and content. The novel as a whole seems much more dense and the characters more fully fleshed than your other works. What were the circumstances that led you to write such an emotionally multifaceted novel that deals with both straight and gay characters in equal measure? Apart from my novels for adults, I've written (under various names) close to 30 novels for young adults, the majority of them with straight female central characters. So this wasn't as big a departure as it might seem. Also, I included both gay and straight characters in my novel Last Summer . One of my favorite characters in that book was a straight woman, Marly Prentis, who was dealing with issues of nearing middle age and trying to figure out what she wanted from her life, particularly from her relationship with her husband. I think Marly's sections are some of the best in the book. Unfortunately, they didn't really belong there, and they got lost. In Changing Tides , I wanted to make sure the character of Caddie got equal time, because she has an important story to tell. Additionally, I thought that many readers would respond to her struggle, as I think what she goes through is something many of us—gay or straight—go through at that age. As for why I did it, my novels for adult readers are about what it means to be a certain kind of gay man living at a certain time in history. Quite a few gay men—including my partner of seven years—were married at one time and have children from those marriages. I thought it would be interesting to write about that experience. The novel begins with Ben Ransome lost in his own world, disconnected from those nearest to him, descending into the water and having an almost religious experience, even as he remarks that it's "like a cathedral." Why do you think Ben connects so readily with the ocean? The ocean is a place where Ben feels safe. No one can bother him there. He doesn't have to speak to anyone and he doesn't have to try to understand anyone. The ocean behaves in more or less predictable ways, and Ben is very familiar with the creatures he encounters there. It's the one place where he truly feels he belongs. When Caddie first arrives, she's truculent, attitudinal and uncaring, and Ben just doesn't know how to handle her. Why do you think she's like this with her father? Caddie is very angry at her father, as she doesn't understand why he left her and her mother and why he's made no real attempts to connect with her. She's not ready to forgive him for that. Also, she's angry at being forced to do something she doesn't want to do, as it makes her feel like a child. For his part, Ben certainly has an opportunity to make peace with Caddie. Why then is he so diffident and wary towards his daughter? Why is he especially bitter over his divorce from Carol? I don't think he's so much bitter about his divorce as he is confused about why it happened. He can't bring himself to examine the real reasons behind it, so his only other option is to retreat to safe ground, which for him means not addressing anything head-on. As far as Caddie goes, he simply isn’t able to open up to her because he's spent so long distancing himself from other people. The fact that she represents his greatest failure in life doesn't make it any easier for him. Sixteen years have changed Caddie into something that Ben "doesn't recognize." Why does he then "long for a diagram" of Caddie, some neatly labeled chart that would point out her salient details? Ben is a scientist. He understands the world by dissecting it and by breaking it down into logical processes. But people aren't logical, and he doesn't know how to understand them because they don't behave in predictable ways that he can explain and anticipate. Caddie uses her affair with Nick as a "potential distraction." But she readily admits that she needs something more. What do you think this need is? Caddie wants to be loved. Like many people, regardless of age or gender or sexuality, she instead settles for being desired. She's smart enough to know this isn't enough, but she isn't ready to admit that the person she most wants to love her is her father. You describe Ben as having "raging inside of him." Why does Ben lose his temper at the fisherman and his young son and then later admonish himself for getting so angry? Ben is a person who wants to be in control of his emotions at all times. He erupts at the fisherman both because he's upset about Caddie's arrival and also because the thing he loves most in his life—the ocean—is being threatened by the fisherman's thoughtlessness. He chastises himself for his outburst because he sees it as a childish response to the situation, but also because on some level he knows that what he was really angry about was his inability to control the situation with his daughter. Steinbeck's "lost" manuscript, "Changing Tides," the story of Charlie and Tom plays a pivotal plot point and is the main reason Hudson actually comes to Monterey. What gave you the idea to use this story in the narrative? Was there an actual story of Steinbeck's that you modeled it on? Because the manuscript is so central to Hudson's story, I felt it had to be included as more than just a reference in conversation. By actually writing that manuscript, I think it added to the atmosphere of the book. It isn't based on anything Steinbeck ever did except in the sense that Steinbeck wrote about the ordinary people who called Monterey home. Why do you think the story of Charlie and Tom resonates so deeply with Hudson? The story of Charlie and Tom is about a man trying to understand feelings he has no words for. For Hudson this reminds him of his own life, as well as of his relationship with his now-deceased lover. Is there any proof that Steinbeck may have had a relationship with his best friend, scientist Ed Ricketts? Not that I am aware of. But a surprising number of people have written to me saying that they've wondered the same thing. There was an intimacy between the men that features prominently in both of their work, and I think it's natural to wonder what might have been. One of my dearest friends is a straight man who operates a dive boat. Like myself, he's a huge Steinbeck fan, and in fact Changing Tides is dedicated to him. I was on his boat this past summer diving in British Columbia, and he remarked that he liked to think that maybe something had existed between Doc and John. Their friendship was clearly so important to the two of them, and both had rather disastrous relationships with women, that you almost can't help but root for them to get together. Hudson dreams of being a successful academic success, but how much of Hudson's desires are fuelled by the ghost of his dead lover, Paul? Hudson is greatly influenced in his quest for academic success by what Paul wanted, at least as far as the possible Steinbeck manuscript is concerned. It's his only link to their relationship. Whether his interest in academic pursuits continues after the book ends is something readers can decide for themselves. When Caddie visits the Aquarium and then begins to dive with Brian – and later with her father - she sets in motion a real transformation. What is it about the undersea world that causes her to experience such personal growth? Diving puts you in a unique position. More than 70% of the world is covered by water, yet we know less about the underwater world than we do about Mars. When you dive you can't help but be totally awed by the ocean. Additionally, diving requires a great deal of thoughtfulness both in terms of maintaining your personal safety and in maintaining respect for the ocean environment. When she begins diving Caddie begins to recognize her own abilities as well as her part in a larger world that is filled with mysteries. Also, she begins to understand her father's obsessions, and that makes it easier for her to begin forging a relationship with him. What do you think attracts Caddie to Brian – apart from the fact that, unlike Nick, he doesn't have a girlfriend? Caddie is attracted to Brian because of his boldness in singling her out. Also, of course, there's the similarity to her father in that both men are studying the sea. On a non-romantic level, Brian's interest in her is the interest she wishes her father would show in her. On a sexual level there's the power she wields through her ability to seduce an older, more experienced man. Ben, Caddie and Hudson all struggle with their demons and insecurities, and their journey throughout is one of personal growth: Caddie to reconnect with her father, Ben with actually learning how to become a father, and Hudson learning to love again, even as he lets go of Paul. In what way are these three people alike? In what ways do they contradict one another? They're alike in that each of them is looking to be understood and to understand themselves. They're contradictory in that each has something that the others don't, and they need these parts of each other in order to get where they're going. Each of them approaches life in a different way, which makes them all see the same situations differently. While this creates the conflict that drives the story, it's also the thing that ultimately brings them together. In what way does Steinbeck's actual novel of Cannery Row affect the characters, especially Ben? The book links the characters to one another. Each of them loves the book for different reasons. For Hudson it's literally the thing that brought him to Monterey. For Ben it's something that inspires him. And for Caddie it's a key to the mystery that is her father. Not to give too much away about the plot, why does the sudden and bourgeoning friendship between Ben and Hudson help both men attain the goals they seek? As in many relationships, each of the men involved provides the other with what he needs to let go of his past and move on. When Hudson first views Cannery Row, he's shocked by the fact that it doesn't resemble his idea of it, certainly not what's depicted in Steinbeck's famous novel. The area is more like an "arcade at a country fair, all bright lights and tourists." For those of us who don't know much about it, how did Cannery Row contribute to the local Monterey economy, particularly that of Steinbeck's era? The first cannery on what came to be known as Cannery Row opened around 1895 and specialized in salmon. But the real boom came during World War I, when the government realized that the plentiful sardines of Monterey Bay would make good food for the troops. Canneries sprang up literally overnight to meet demand. The industry employed more than 5,000 locals and was central to the economic health of the area. Unfortunately, the sardines were fished almost to extinction, and by the time Steinbeck published Cannery Row in 1945 the industry was almost dead. As quickly as the canneries had sprung up they "mysteriously" burned down so that their owners could collect the insurance money and move on to other ventures. Why is Hudson so shocked that Cannery Row has changed? Hudson has lived for so long with the image of Cannery Row that he has from reading Steinbeck that he can't imagine it any other way. Logically he knows it won't be the same, but emotionally he longs for it to be. It's a bit like when you return to a house you lived in as a child after many years away, or when you see someone you knew in high school twenty years ago. Your first reaction is often to not recognize the place or person because you're still seeing it through the lens of your original experience. What in particular appealed to you about making Monterey central to the story? The book wouldn't exist without Monterey, which is a place I spend a lot of time in. The Steinbeck connection and the diving aspects of the book all required that I set the book there. Initially I decided I wanted to write a novel about the ocean, so really Monterey was the inspiration for everything that became Changing Tides . You go into quite a bit of detail about deep-sea aquatic life. How hard was it to write about this subject and how much research did you have to do to in order to recreate this world in such vivid and quite beautiful detail? The marine biology aspects of the book were actually the easiest to write. I've been an avid diver for a number of years, and I spend a lot of time underwater in Monterey. I taught diving for a couple of years, and nudibranchs happen to be something of an obsession of mine, just as they are for Ben. So everything in the book relating to marine biology came out of my own experience, which was enormously helpful. One of my favorite dive spots in Monterey is located at the site of one of the biggest canneries. At one point the owner of the land wanted to open a golf museum there, but the diving community fought long and hard to make it a marine park named after Ed Ricketts. I think of him every time I dive there. The symbolic power of the ocean seems to have the capacity to change lives, and throughout the course of the novel it allows Ben, Caddie and Hudson to grow and transform. Why did you choose this as the theme for your novel? I've long had a love affair with the ocean, which was deepened when I started diving and saw what a magnificent world there is beneath the surface. What's most interesting about the ocean is how it itself is a living thing apart from the creatures that live in it, and how different people react to it in different ways, often based on their approaches to life. You can send two people on the same dive in the same spot and one will come out thinking it was the best dive of all time and the other will think it was the worst. Similarly, one diver will react to challenging conditions like current or waves with fear and resistance while another will enjoy being surrounded by the power of the water. I've often found that these reactions relate directly to how a person reacts to situations in his or her own life. Would you like to talk a bit about the forces of metaphor and symbolism that echo throughout? I'm not sure there's a lot to talk about. I think the symbolism in the book is pretty obvious, and I certainly didn't try to make it subtle, as there was no reason to. The characters learn to explore their own lives by exploring the underwater world, which has often been used to represent the subconscious. What did you find the most challenging in writing Changing Tides ? How different was the experience from writing your previous novels, Last Summer , Full Circle , and Looking for It ? The biggest challenge was trying to make the marine biology details interesting without being overwhelming. The danger when writing about something you personally love is that you'll overdo it. Some readers have indeed found those bits distracting, although the vast majority seems to enjoy them. As for how writing this novel was different from writing the previous ones, I think it was a bit easier because a lot of it came from my own experience. And certainly in comparison to Full Circle I didn't have to do nearly as much research. Is there a character in Changing Tides that most resonates with you? Ben is the most like me, both in behavior and in his love of the ocean. But Caddie is my favorite. Quite a few readers dislike her, but to me she's the most honest character in the book. She's honest about how she feels, and she takes on the world with a ferocity that I think is admirable. I think if you ever were a teenage girl or had a teenage daughter or sister, she's very recognizable. My suspicion is that the readers who dislike her do so because she cuts a little too close to home. Now that you’re an established fiction writer, and have a track record of titles behind you, what lessons – if any – have you learnt about the art of writing? I've learned not to worry so much about the story of a novel. What's important is what you have to say. Once you know what that is—what experience it is you want to capture—then the characters and plot follow. I used to worry way too much about what would happen in a book, which is why the earlier ones read a bit like television shows. Too many books on writing tell you to come up with an interesting idea, which I think is what stops a lot of people from writing. The truth is that what you have to say can usually be told in any number of ways. You just need to find the way that works best for you. And finally, for all us Michael Thomas Ford fans out there, are you working on a new novel? If so, would you like to share with us a little bit about it? My next book for adults, What We Remember , will be out in August of 2008. It's about what happens to a family when they learn that the father, who they believed to have committed suicide seven years previously, was actually murdered. The novel alternates between the events of seven years before and the present investigation, during which all kinds of family secrets are revealed. Although it sounds like a mystery, it's really about the different ways in which we lie to ourselves and to others in order to maintain the appearance of normalcy. My next novel for young adults, called Suicide Notes , will be out in October of 2008. It's a blackly-comic look at a young man's stay in a psych ward after he tries to kill himself. Michael Thomas Ford is the award-winning author of numerous books, including the popular "Trials from My Queer Life" series of essay collections, and the novels Last Summer, Looking for It and Tangled Sheets. He lives in San Francisco with his partner and four very bad dogs. Michael Leonard is a contributing reviewer to curledup.com. 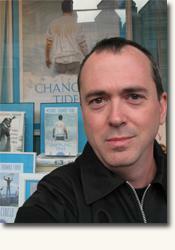 His interview with Michael Thomas Ford was written in conjunction with his review of Changing Tides . © Michael Leonard/2007.